Branson’s “Comedy Hypnosis Dinner Show” serves up entertainment that’s both outrageously funny and incredibly intriguing. There are no other Branson shows that offer an experience like the one delivered by talented comedian, Jecobie Roberts! She happily invites you to let go and let her guide your actions, or to enjoy the hysterical antics on stage from the sidelines. Either way, you’re sure to have the time of your life at her show! Jecobie is especially adept at using humor and her skill as a hypnotist to tickle your funny bone and befuddle your brain! In addition to the fun she has doing the “Comedy Hypnosis Dinner Show,” Jecobie has traveled far and wide to entertain folks with her quick wit and her talent for transfixing willing subjects. She performed at the 1984 Summer Olympics, in Columbus Square in New York City, at Disney World and Disneyland, and in prison; fortunately, not because she was incarcerated, but because San Quentin had an audience that readily accepted a chance to escape, even if it was just in their minds! Jecobie’s talents aren’t limited to bemusing our brains with hypnosis; she’s appeared on national radio shows throughout the country, published several articles, and written two books, including Unveiling the Secrets of the Soul, a fascinating read about the world of hypnosis. · Pineapple Honey Glazed Hame: A juicy hickory smoked ham sliced with our very own honey glazed ham with pieces of Golden Delicious Pineapple on top. The pineapple is fresh cut daily. · Baked Chicken: For a healthier option, we bake Bone-In chicken in our special blend of rotisserie seasonings. White and Dark meat mix. You Get to pick the pieces you like. · Made from Scratch Mashed Potatoes: These potatoes are cut fresh daily. We NEVER use instant potatoes. And for dessert we serve Grandma's Apple Cobbler. Fresh Brewed Ice Tea, Cool Refreshing Ice water & Lemonade with Fresh Squeezed Lemons to wash it down. 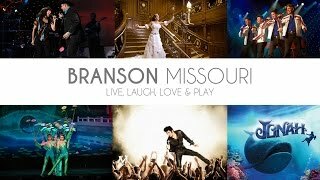 Book your tickets for Branson shows through the Branson Tourism Center today.